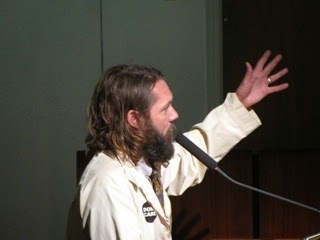 Well, even relatively short City Council meetings in Costa Mesa can be full of drama. We saw that last night in a meeting that lasted just a hair over three hours, yet left many attendees feeling unfulfilled and frustrated. 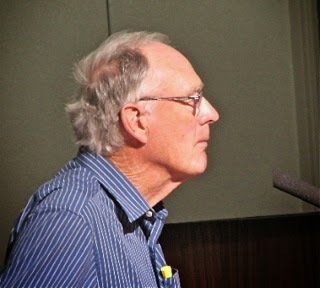 Public Comments saw only 9 members of the public step up. 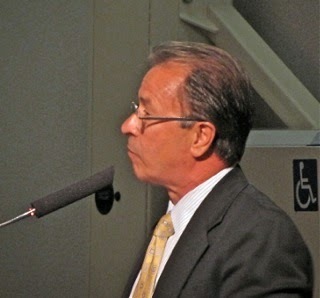 Among them was Parks and Recreation Commissioner Bob Graham, who wanted the council to consider undergrounding the utilities throughout the city, suggesting that the Newport-Mesa Unified School District used bonds to make major infrastructure improvements, so the City should consider this process, as well. Later, in response to the question, Director of Public Services Ernesto Munoz gave us the facts. Southern California Edison does the work. The most recent estimates - be sure you're sitting down for this - were that it would cost $850 million just to do the arterial streets and another $320 million for the residential streets! That's probably going to pencil out to $2 BILLION today, since those numbers are a few years old! Munoz told us last night that just the engineering design work would cost more than $8 million. And, that just gets the utilities to the curb... residents have to cover the cost to get them to their homes. The last time this came up - during the Allan Mansoor regime - I had a contractor friend give me an estimate for my house. It would have cost at least $15,000 to do the work! Another speaker was concerned about the proliferation of Group Homes throughout the city and also expressed concern about the configuration of Mayor Jim Righeimer's Preserve Our Neighborhoods Task Force, citing the need to balance the membership with actual people impacted by the problem. She mentioned that one member operates a group home. 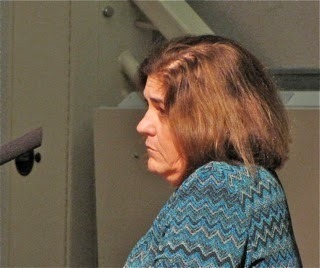 In his response Righeimer indicated a willingness to expand the numbers once the staff gets their process figured out. He also moaned about what a big problem it is, using the term "trifecta", meaning that group homes are protected by the Americans with Disabilities Act (ADA), some Fair Housing issues and it is a multimillion dollar industry. 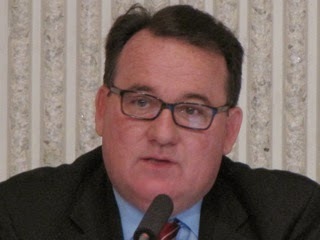 He emphasized, again, that dealing with the group home issue is going to involve costly legal challenges. Swell! More lawyers! Geez! Other speakers expressed concern about the shortage of police officers and the number of hours they are being required to work to keep the city safe. 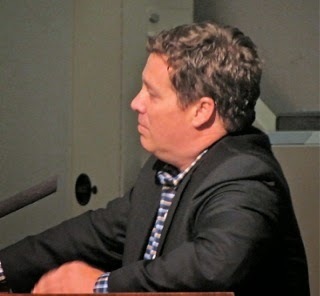 Chris McEvoy questioned why we need a Charter; the controversy around the Friday Night Lights Football program; where was Monahan last meeting and wondered if the private investigator hired by Mensinger to video campaign sign destruction - referring to the Steven White case - was a "campaign expense". 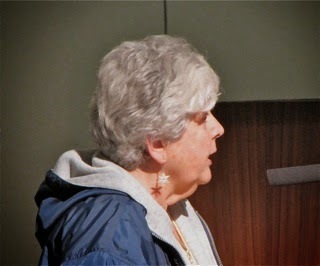 Sue Lester reminded the audience that there will finally be a meeting of the 60th Anniversary volunteer group in the Emergency Operations Center on April 9th at which they will have a chance to express their views on how it went. Seems strange, doesn't it, that it's taken three quarters of a year for this meeting - that should have been held within a couple weeks of the event. Lester also told us of the drilling being done in Fairview Park. We'll likely hear more about that at the Fairview Park Citizens Advisory Committee meeting tonight at the Neighborhood Community Center beginning at 6:00 p.m.
Just after 7 p.m. we began hearing the marquee event of the evening - Old Business #1, the delayed second reading of the proposed Small Lot Ordinance, HERE. Some refer to it as "Christmas For Developers", since it sweeps aside those darn codes put in place to protect our neighborhoods by requiring open space, parking, set backs and the like to keep our neighborhoods livable. 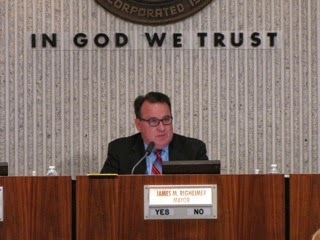 One speaker, Developer Joe Flanagan, spoke in favor of it... big surprise, huh? You can read Bradley Zint's coverage of this issue in the Daily Pilot, HERE. 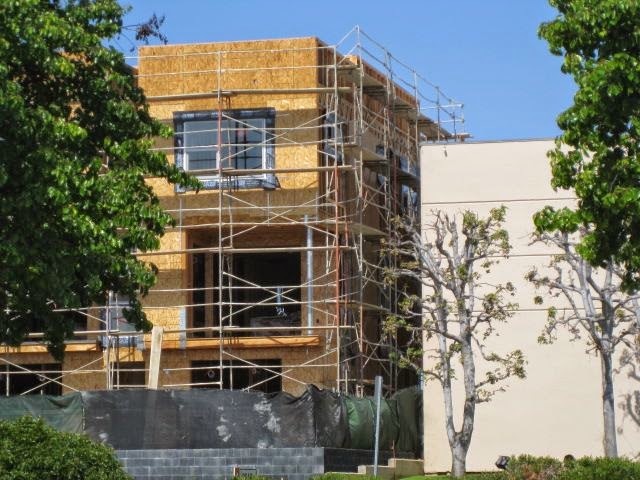 The diminished city planning staff has had trouble dealing with projects being thrown at them over the past many months which have required dozens of variances, adjustments, etc., in order to be approved. Former Director of Economic and Development Services, Peter Naghavi - now retired - was one of the four persons who spoke in favor of this ordinance of the thirteen who addressed the council on the issue. He spoke in favor of the ordinance because it will streamline the processing. 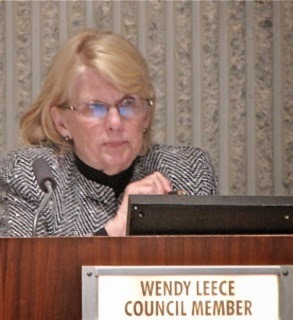 Well, as Councilwoman Wendy Leece later said, "I don't think we should be in a hurry to make things easier for developers at the expense of residents." I agree with her. Even though I respect Naghavi and his decades of service to the community in a variety of senior staff positions, implementing an ordinance to solve a staffing problem is the wrong way to go. The staffing shortages, contributed to in great part by the toxic workplace atmosphere created by the current council majority, can be managed via the use of contractors until permanent employees are hired. We should not be changing the rules that are in place to protect our neighborhoods to make it easier for developers to make a bigger profit in our city. THIS IS WHAT WE WANT? As part of the discussion resident Greg Thunell used his three minutes to show some examples of projects currently underway in the city. This image is of one being built at 15th Street and Industrial Way, and shows the massing adjacent to a storage facility. 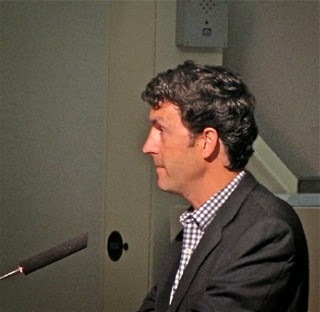 I was amused when Planning Commission Chairman Jim Fitzpatrick wandered to the speaker podium and proclaimed, "I rise to speak in favor of this ordinance." Gee, no kidding, Jimbo! It's very unusual for the chairman of the commission to step up to speak in favor of an ordinance that his commission has passed on up the food chain. Then, again, Fitzpatrick seldom misses a chance to do some serious fanny-smooching. Speaker Cynthia McDonald quoted from a Shakespeare soliloquy to make a point, and speculated about what the epitaphs might read on certain council members headstones considering their positions on this ordinance. Most of those who "rose" to speak against the issue stressed the density, parking, traffic and bowing down to developer wishes instead of doing what was right for the residents. 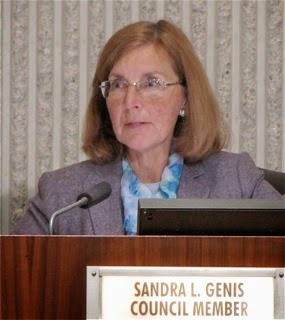 Councilwoman Sandra Genis presented compelling views about why this was NOT the right ordinance, and suggested we go back to the drawing boards if the council actually felt such an ordinance was essential. She was given a deaf ear by the majority. In an interesting turn of events, Mayor Pro Tem Steve Mensinger moved to approve the second reading - Gary Monahan (who actually came to this meeting) seconded it. Then Mensinger said he wanted to make a couple changes - eliminating the requirement for guest parking for developments of 5 or more units and to change the setback requirements. Both of these changes would have made a bad situation even worse and there was a wave of grumbling that spread through the auditorium when he made the proposal. However, contract City Attorney Tom Duarte reminded the council that, if those changes were made, it would require yet ANOTHER second reading. Monahan withdrew his second and Righeimer muttered something about "just getting this done and we can come back with changes later." The message I took from that comment is that there are developers poised, waiting to pounce, so we should pass this thing quickly. Very telling, especially when you consider that this kind of behavior will become even easier if a Charter is passed next November. The item passed as written on a 3-2 vote, with Genis and Leece voting no. It may be interesting to note that the final line of that soliloquy McDonald was quoting earlier was, "And men have lost their reason." In other business, the request from the Police Department to authorize a reward to facilitate the solution of the murder of Gary Smola was amended to read "up to $10,000" and passed, 5-0, after less than a 1 minute discussion. Tina Wlasick - 2 year. Leece suggested that the remaining applicants for this slot contact the Senior Corporation Board directly, since they will be soon replacing member David Stiller, who recently passed away. Only two items had been pulled from the Consent Calendar, #4 and #6. Resident Eleanor Egan suggested that, in the case of #4, the contract for Bus Shelter Advertising, some stipulation be made about just who decides about what kind of advertising can appear. Right now the vendor decides. It passed as is on a 4-1 vote - Leece voting no. Since the person who pulled #6, the swapping of Business License information between the City and the State, was no longer in the auditorium it passed on a 5-0 vote after a very brief comment by Interim Finance Director Steve Dunivent and the meeting adjourned at 9:10 p.m. Unfortunately, earlier in the meeting Righeimer found it necessary to rant about the speakers who take the time out of their busy lives to study issues and present their views to the council. He, apparently, would just as soon they stayed home and not bother him with their complaints/observations/suggestions. After all, he and the council were elected to represent the people! This guy continues to confuse public service with dictatorship. We'll do what we can to remind him as the campaign season moves forward. Fitzpatrick rises up to vehemently deny that he was ever in Lions Park holding a cardboard sign that said, "Will lick boots for food." Thanks for the great report, Geoff. When Steve Mensinger wanted to make changes to the Small Lot Ordinance, Righeimer had no problem with it. When Sandy Genis wanted to make changes, he ranted at her, calling her out in public! She sent him an email regarding this earlier, yet he chided her for " waiting till the last minute" because he hadn't bothered to check his inbox to find it! This guy is a rude, crude, unfit for public office JERK! 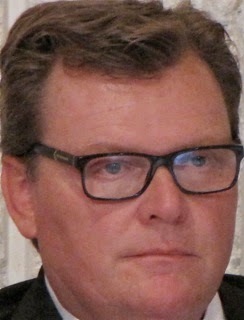 Riggy- we aren't a dictatorship, will never be and we need to get rid of you ASAP. Gary needs to let Jim and Steve finish telling us what their proposed motion is before he blurts out " I second the motion". Is he always in a hurry to get somewhere else? I'm amazed that Righeimer is behaving as badly as he does on the dais when he running for reelection. Is he banking on lies, rumors and scapegoating to win the election for him? What an interesting couple of days in our humble little town. Two new 'opposition candidates' enter the ring in Weitzberg and Bunyan, and it looks like the current power elite just might lose a chunk of the youth sports vote with Gordon Bowley's resignations. Who can these guys tick off next? The dominoes are falling. Guess it's time to go back on the anti-union offensive. I'm sure Jim F Squared (Fisler and Fitzpatrick) will be firing up their keyboards and just might wear them out as they continue to go on the defensive in the Pilot comments. @ Mike McNiff-- not only will it be the posts online but stand by for the old propaganda golf cart to get dusted off and start making the rounds on the Eastside. Fitzy has been waiting a long time to get that thing fired up, but hey, lets just make sure you keep everybody safe this this time and put seatbelts on the kids.